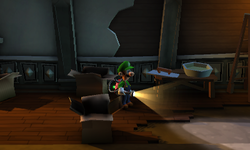 The Archives is a room located in Treacherous Mansion in Luigi's Mansion: Dark Moon. Found on the second floor on the west side of the mansion, it's accessible via the West Corridor and is located between the Aviation Exhibit and the Space Exhibit. In the room itself, there's a table and ladder to the right, four cardboard boxes to the left and very little in the way of other decorations. This room is entirely optional in all missions bar possibly Terrifying Invasion. During A Train to Catch, Luigi can explore the Archives for extra money. If he examines the boxes, a Greenie laugh will be heard, the boxes will close, then open again, and Luigi must examine them in the order they reopened first. If done correctly, a Gold Greenie appears that can be caught for cash. In Terrifying Invasion, the Archives is one of the rooms that may be infested with ghosts. This page was last edited on October 10, 2018, at 01:47.